Tertiary education faces multiple challenges. 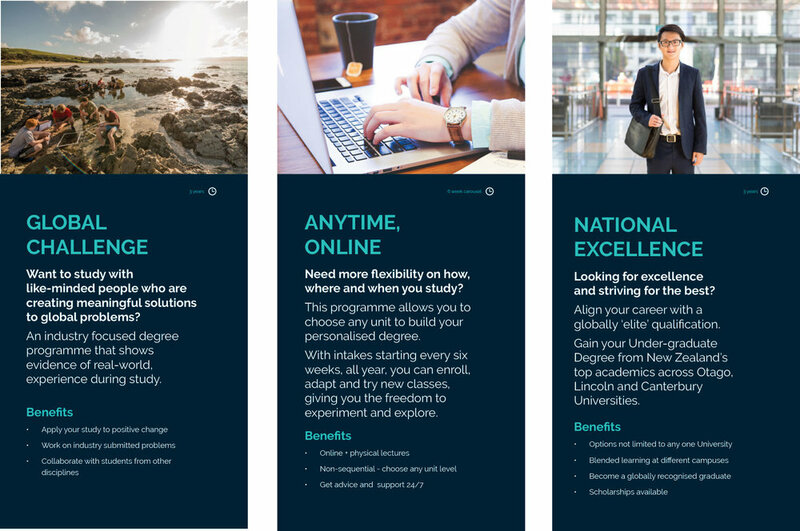 Working with Education New Zealand we developed a framework to enable New School Thinking within Tertiaries to catalyse a shift in the way they bundle their content. Mobility trends of international students from traditional markets are shifting. Technology has disrupted all parts of our lives except traditional higher education. The academic structure of Universities is one of the oldest systems in our modern world. Non-traditional providers are increasing in relevance with new product offerings. Given the market and technological shifts, how do we encourage our traditional tertiary institutions to develop non-traditional products? To use Human Centred Design to engage academics in a new way of thinking about their content and to prototype and test new approaches. We brought 20 academics together from three NZ Universities for a two-day innovation workshop. We used a mix of two methodologies. Design Thinking, or otherwise known as Human Centred Design, and an adaptation of the Lean Canvas which we’ve called the ‘Marketplace Canvas’. There is a growing gap between what employers want from a graduate and the experience they are graduating with. A range of new product concepts were developed during the workshop. These were then validated through a series of focus groups with international high school and post-gradutate students. Three of the re-bundled packages we identified as having the best market fit. The Global Challenge programme was further developed into a proof of concept called the Emerging Futures Summit.